Your bus was one of my main highlights of the weekend. Insane survivor. 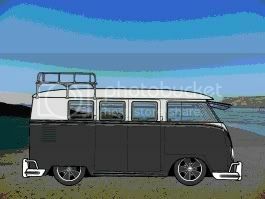 Everything different to my bus but both cool, this is what makes me love the VW scene. Oh and found this picture the other day which I believe is another forest find pic of my bus. Hats off to you, so creative thinking going on! Just wondering if you've joined the steering column to the T25 transfer box yet, if so, how did you do it in the end? Restoring a splittie is like have the worlds biggest meccano kit but someone has thrown away the instructions. Easier than a later bus. Excellent Great photos from Amersfoort. When I hear people say "I wish I could have a samba" - the amout of work, graft, sweat you've put into yours. Saw it in Ben Pon... it was actually my favourite of all cars there! !